The following is a paper entitled, “La Glace á Trois Faces: An Examination,” which I wrote for my Global Cinema course. The paper analyzes an excerpt from the French Impressionist film La Glace à Trois Faces (The Three-Sided Mirror) from 1927 by director Jean Epstein. I have added some images in the typical TWR (The Written Reel) style to provide some context. The Reel Rating for this film is 2.3 (by some act of God surpassing The She Gods of Shark Reef as my all-time lowest rated film). Because the paper is not actually a review of the film, I want to briefly provide my reasoning for this obscenely low score lest my words of “praise” confuse you with the reality. First, as the film is of the silent persuasion, it necessitates musical accompaniment. Where the music could have stood to somehow improve upon the confusing nature of the narrative and editing style. What we are instead offered is an absolutely jarring score complete with what seems to be background noises at a séance, the bang of a trashcan, and at points the scratching of a chalkboard (intrigued?). 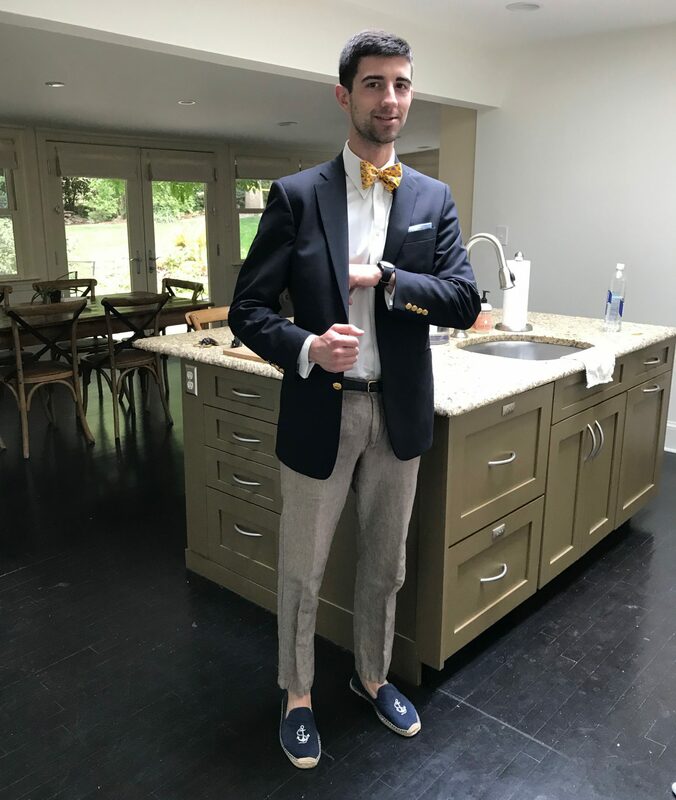 To boil the plot down to one sentence; a wealthy man has fallen in love with three women at the same time, but his aversion to commitment and responsibility lead him speed his sports car to the beach and, en route, be hit and tragically lose his life at the wings of a passing swallow. My examination is of one specific scene in which the man finds himself in a room with one of the women and the phone rings (that’s about all I can really provide; apologies). While my paper may give credit to Epstein for creativity and embodying the movement of French Impressionism (and avant-gardism), the fact of the matter is that this type of film reminds me why very few people (if not for this class, myself included) know of the genre. If all of this has you watering at the mouth, I have included a link to the film (the clip I analyze here is from about 0:43-3:09). If this is does not seem to satiate your hunger for “Avant-Garde, Experimental Cinema of the 1920s & 1930s”, Amazon offers a collection with that title for $63.98. You better hurry, I hear its making a comeback (please don’t buy it). I never thought I would say that an eight minute movie was excruciatingly long, but this is the case here. Enjoy. 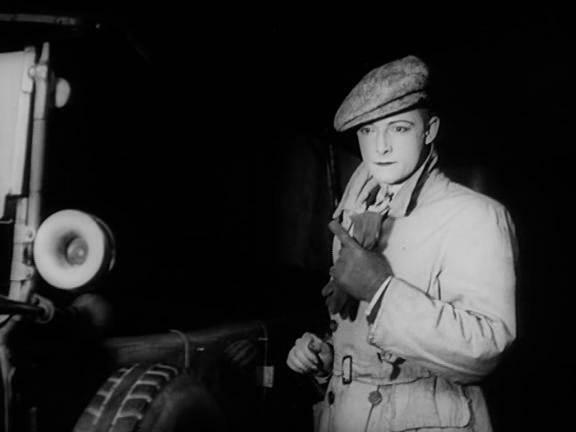 The film La Glace à Trois Faces (The Three-Sided Mirror) is the work of French director, Jean Epstein. Generally speaking, the film finds its place in the French avant-garde cinematic movement of the 1920s known as French Impressionism. In it’s most basic definition, avant-garde translates to “advance guard,” or perhaps more appropriately, “ahead of the crowd.” Various forms of experimental filmmaking characterize this movement in cinema. Avant-garde films of this period strayed from the traditional narrative which was developing in America and elsewhere by using alternative methods of editing, character development, mise-en-scène, etc. The Three-Sided Mirror, having been made in 1927, was undoubtedly influenced to some degree by the Surrealism and Dadaism which peaked interests and reshaped culture in France at the time. France, ever the fountain of nouveau art, was a logical place for such movements to develop in cinema because of the lack of control by the state or commerce of the industry. The Three-Sided Mirror employs montage and varied shot selection as some of the methods used to mold the film’s storytelling. 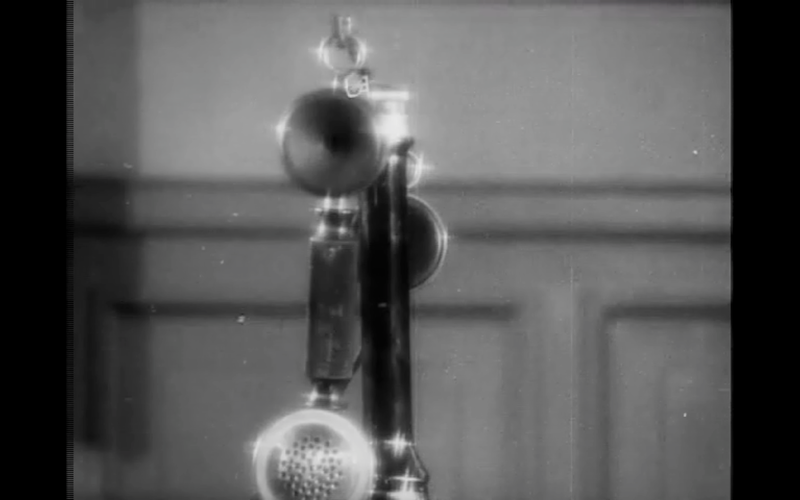 This clip illustrates the elaborate mise-en-scène of the film. Both characters are lavishly dressed: the man wearing white tie and silken robe, and the woman in flowery dress with excessive strings of pearls. These costumes stand in stark contrast to the simplicity of the set itself. Prior to the scene’s final few shots, only limited exposure is provided to the set with its basic colors and sparse carpeting. It is not until these final few shots that the room is truly shown to be a geometric kaleidoscope. The sight of the room in full effect is dizzying in much the same way as the optical illusion device. One cannot help but notice a thread between the complicated web of relationships among the film’s characters and the complexity of the set in this scene. By the nature of the set, the scene expresses the tension and emotional intensity through high-contrast lighting. This method of lighting puts emphasis on the character’s faces, drawing the audience to their emotional responses. 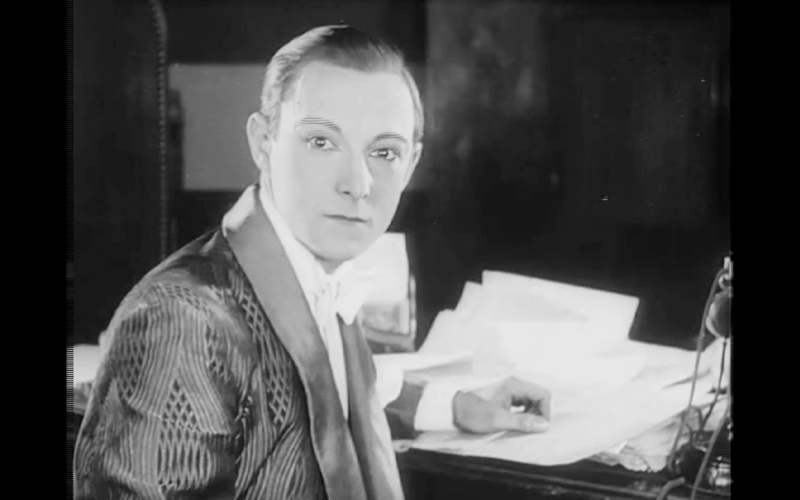 The lighting is not limited to its application on characters in the film however. 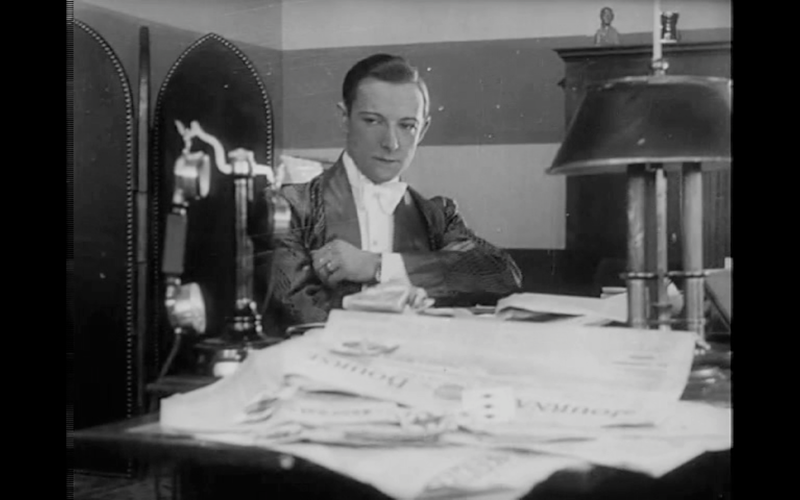 In this scene in particular, the phone on the desk acts as a key device for the development of tension. Because of its significance, it is well-lit and stands out from the room in which it stands. This is in much the same way as the diamond ring which the man removes from his pocket. The ring is lit to sparkle, just as the woman’s eye which looks upon it with envy. Epstein places a paramount in this film on experimentation of editing: a focal point in French avant-garde cinema. This scene demonstrates his affinity for montage and his overall desire to break with traditional narrative cinema. The footage is edited in several instances to have certain images fade in on top of one another. 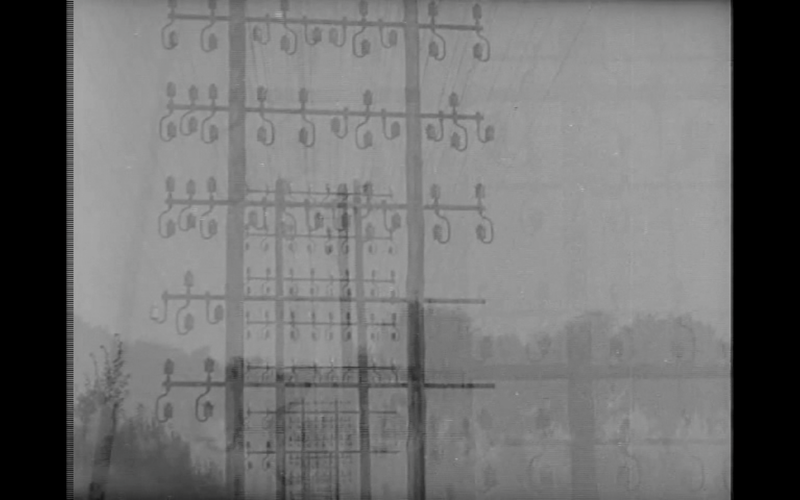 This style is seen early on in the scene when the telephone poles are transposed on each other as the camera moves passed them. The way these shots are edited gives the viewer the experience of “watching” the communications pass through the telephone wires. Shortly after cutting back to the room, the phone rings, and the message that was seen traveling earlier has finally arrived. Epstein also experiments with a variety of shot types. While many of the shots in this scene are medium shots and close-ups, Epstein sprinkles in some long shots. One of the shots in this scene has the man break the fourth wall and stare directly into the audience, reminiscent of the “cinema of attraction” of earlier films. He describes this type of shot in his writing, “Magnification,” saying, “[the face] seems to address me personally and swells with extraordinary intensity. I am hypnotized” (“Magnification” 235). He also frequently uses close-ups and even some extreme close-ups as on the telephone and the woman’s mouth. It is clear, as evidenced in “Magnification,” that Epstein was fascinated with the close-up and what it is able to convey to the audience. These close-ups feed into the narrative Epstein attempts to formulate. He describes the effect of the close-up as a shot as one which, “limits and directs the attention” (239). In some ways it seems as though Epstein would have been outraged by the integration of sound to the cinema. He repeatedly says that the eye is the element which holds all human attention, and this helps to explain why he placed such emphasis on editing and other storytelling techniques to convey his messages. He even goes so far as to say, “One cannot listen and look at the same time… Music which attracts attention or the imitation of noises is simply disturbing” (240). Epstein’s opinions about the idea of a sensory hierarchy suggest that he sees film as the most efficient and influential medium for the communication of ideas. This belief indicates that the popular view of cinema at the time (seen largely as entertainment) should be changed to reflect the emotional, captivating power of the medium. La Glace à Trois Faces is a great example of the French avant-garde movement of the early 20th century. The film illustrates the desire on the part of filmmakers to challenge the conventions of the industry at the time. Epstein’s work attempts to underline that film should not fall victim to any standard, especially that of the “classical” Hollywood narrative. La Glace à Trois Faces is an “art” film and one which effectively separates itself from its contemporaries. Due to its unique style and aesthetic, the film highlights and relishes in an entirely different form of narrative. Yeah I will most likely never be watching this movie haha. Solid paper about a subpar movie. Keep em coming!